Here is an interesting photo that I haven’t posted because I had submitted the article to an online magazine. Unfortunately, the magazine hasn’t been able to launch because of technical issues. It has been a few years now, so I am posting it here. On October 8, 2012, my sister, my brother in law and two of their friends went for a hike on Mt. Shaw in the Ossipee Mountain Range of New Hampshire. When they reached a good spot to take a break, they stopped for a snack and a drink. My sister reached into her bag and grabbed her camera. She took some photos of her friends and the scenery and then they proceeded on their way. When they got to the top of the mountain it was overcast and chilly with a light rain falling. My sister grabbed her camera once more and took more pictures. 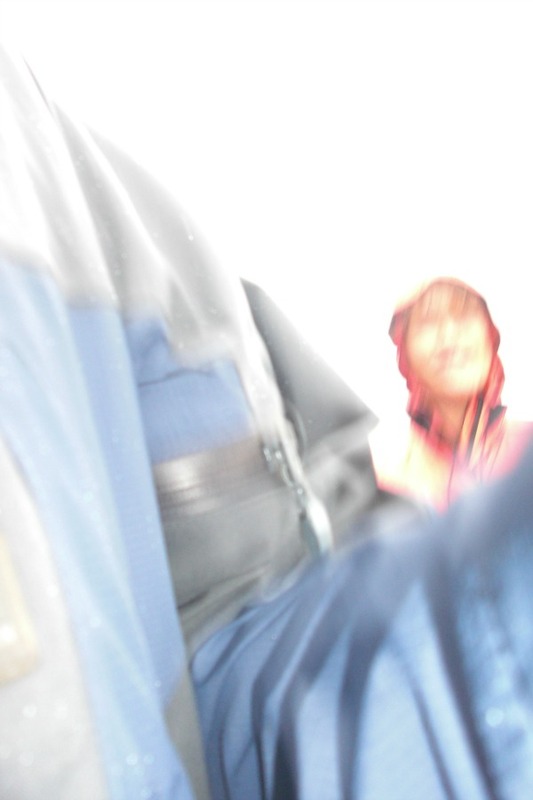 Nothing seemed out of the ordinary while they were on their hike, but when my sister got home and checked out what was on her camera from their day, she noticed this odd photo and immediately sent it to me. She believes when she grabbed her camera out of her bag, she must have pressed the shutter button, because she does not remember taking this picture. To the left is her friend’s jacket. You can see his chest and his arm that has a zippered pocket on the sleeve. His arm is bent, and you can see the little droplets of rain on his coat. What is interesting, is the person that is standing beyond him, in the crook of his arm, was not a member of their foursome. Not one person was wearing a red jacket or even resembles the person in this picture. There were no other people around them on the trail when they stopped or at the summit. It almost looks as if the person is wearing some sort of veil over their face. You can definitely make out a nose, neck, chin, mouth and brow and cheek bones, but there is a void where the eyes should be. I can’t tell if her eyes are closed or if they are missing. Who is this mystery person and what is she doing on Mt. Shaw? I spend my time doing some interesting stuff, but on this particular evening, I was procrastinating. I was supposed to be cleaning, but instead I found myself looking at some coins that I had thrown into a little wooden box on my sideboard. I had recently been to a vending machine that took five dollar bills and had spat out dollar coins as change. I had dumped them with the rest of the change that I collect from various pockets while doing laundry, and as I was pretending to dust, I noticed my coins were piling up and decided to count them. I grabbed out some coins and chuckled to myself, as I had a Gettysburg quarter and Ulysses S. Grant dollar coin in my hand. I thought “What are the odds of that happening” and decided to take a photo of them with my phone. That is when I realized that I was being watched. I instinctively looked toward the spot where I felt the eyes of a male staring at me, toward the window. I did not see anyone out there, and snapped two pictures with my phone. I opened up the second one first, because the last photo you take is the first one that opens. There was nothing unusual about it, just a picture of a window. I studied it to make sure I didn’t miss anything. When I opened the first photo, I immediately noticed a face. “There you are!” I said to myself and then I said “Thank you” out loud to the spirit who allowed me to photograph him. I noticed that he is wearing an open uniform coat with shiny buttons running down his chest. 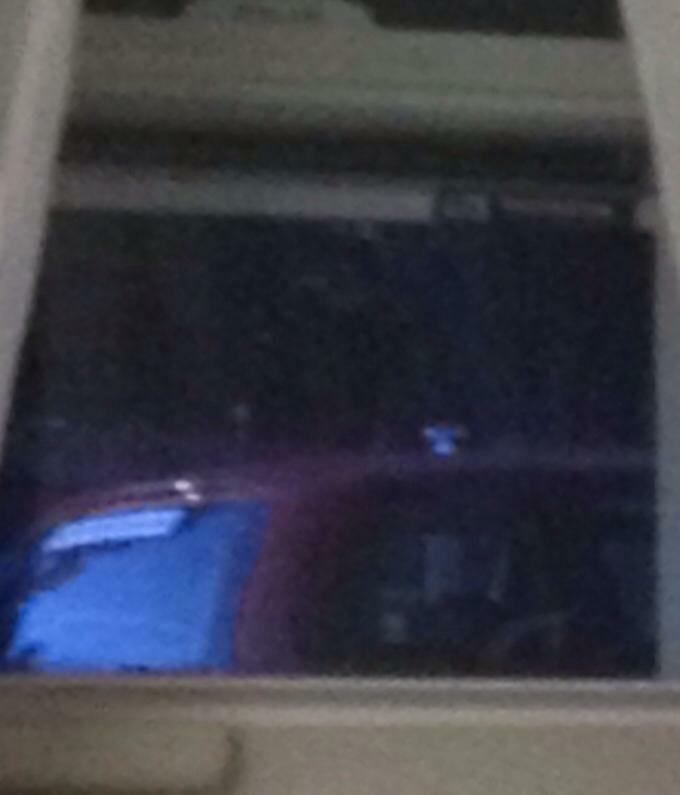 Others who have seen this photo say they can see the part in his hair, and that it appears to be in front of the white metal of the window screen frame. I personally see him in my minds eye wearing a hat, so when I look at this photo I think he is wearing a hat. Leave your comments below, I always love to hear what other’s think. I have been very lucky to catch the images of those who have passed. I am grateful they allow me to do so. A polite word can go a long way, SO… If any other spirits are willing, I would like to put it out there that I would be happy and honored to be their photographer! Say “Cheese”! If you would like a truly haunted experience where paranormal activity is measurable on every floor, you must take a trip to the Haunted Victorian in Gardner, MA. 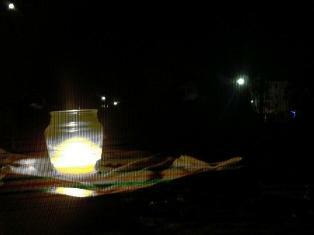 On the evening of November 5, 2011, a curious group of guests did just that. Bundled up in coats and hats and gloves, the guests were split up into 3 groups and were led through the mansion by Ron Kolek, Anne Kerrigan and members of the NEGP team. Clay Rucker and I led our first group to the 3rd floor. K-2 and EMF meters were active right away as people made their way down the hallway past the small bathroom and toward the rooms that would prove to be interesting. We had interaction with a boy who answered some questions by lighting up the K-2 and manipulating dowsing rods, and the answers I was getting psychically were confirmed by Clay’s pendulum. When the K-2 meters went silent, Clay would ask where I felt his energy. 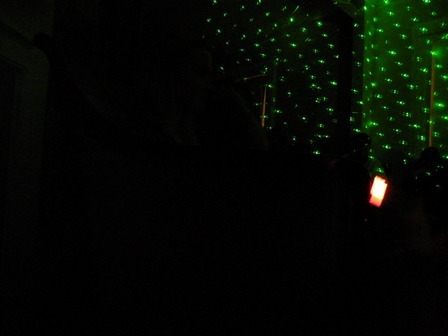 I pointed out where I felt him, and the k-2s again lighted up as we found and followed him around the room. 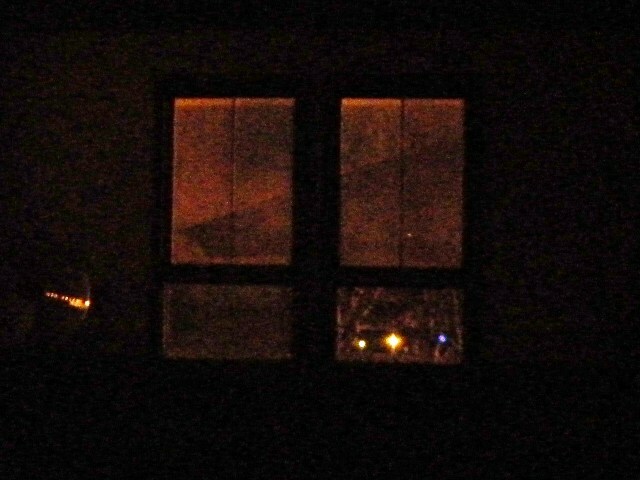 In the last bedroom on the right we encountered another spirit. He was a man who felt shameful. I believe he was a son of S.K. 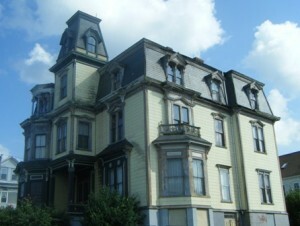 Pierce, the original owner of the mansion and the furniture factory across the street. He also interacted with the K-2 and EMF meters, as well as the iOvilus, dowsing rods and the Talker ITC. The second floor was equally as active. An interesting room on this floor is the Nanny’s room. There is a spot on the floor, just to the right of the closet door where there is a noticeable energy change. Each guest stood on the spot and each guest had a different experience. Some guests felt nothing while others felt lighter, wobbly legged, dizzy or heavy. We all noticed that as we stood in the Nanny’s room that we were all warming up. It was a steady 48 degrees in the mansion, but in this room our hands and feet were noticeably warmer and there was a warm spot next to a teen-aged member of our group. The digital thermometer confirmed the rise in temperature with reading into the 50s. The Nanny must have been taking care our teen guest. We also experienced a variety of energies in the master bedroom. I first picked up on a woman. I could feel my left ovary and part of my uterus. I believe she passed in the house, and because of the symptoms I experienced, I think she died of ovarian or uterine cancer. It may have been another cancer, that had metastasized to these areas. We had a member of our group who was visited by her grandmother, and there was also a male who hung back and never quite came forward, but I could feel he had a bad liver which tells me he was a drinker. The last area that Clay and I would explore with our group was the basement. There are many rooms in the basement. To my surprise, there was a lot of female energy, not something you usually find in basement areas. Come to find out, there is a kitchen in the basement and to keep the family cool during the warm days of summer, the servants would cook the meals down there. 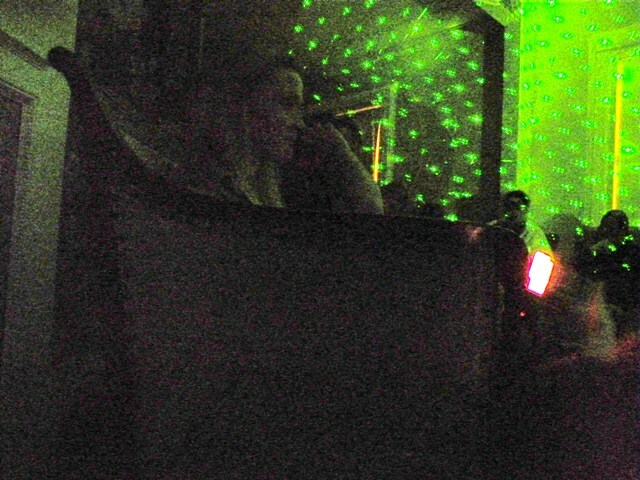 There was also a female who interacted with us by manipulating the k-2 meters in a room that can be accessed by a doorway at the bottom of the stairs, then turning right. She was intimidated by an angry bully of a male spirit who moves through that same doorway but we found in the room to the left. He was not happy that we were in his space. He, by nature is a stern curmudgeonly sort, and I believe him to be a worker of the factory across the street, employed by S.K. Pierce. Just outside of this room there is a cemented up tunnel that once ran under the road and directly into the factory. I feel he is directly connected to this tunnel. As our group asked him questions, he became more and more agitated. His energy seemed to grow stronger but then pulled back. As fast as it seemed to dissipate, it came back and filled the room in a rush. We noticed how bone chillingly cold the room became as his anger was readily felt, and we noticed how we suddenly could see our breath as it hung in icy clouds about our faces. Clay and I became concerned for the safety of our guests as I was sensing that he may touch, push or scratch one of us, so we left him. We exited the room through the doorway that led us to walk past the original furniture of the house, built by S.K.’s factory that is piled against the wall in the hallway where the tunnel opening lays. We entered the room across the hall and could feel him glaring at us from the room we just left. In an attempt to intimidate us, icy breezes began to swirl about our lower legs as the riled spirit entered the room we were now in, following us and threatening to harm our group. We returned to the summer kitchen through the back doorway under the stairs. The angry spirit wasn’t about to let us be, as he watched us from the doorway at the bottom of the stairs. Feeling him stare, I decided to take some pictures. I took two in succession. 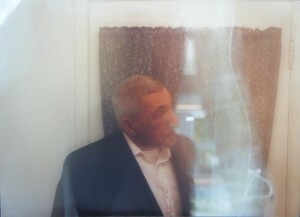 The first photo show an unexplained cloudiness in front of the door from where the spirit stood and glared. 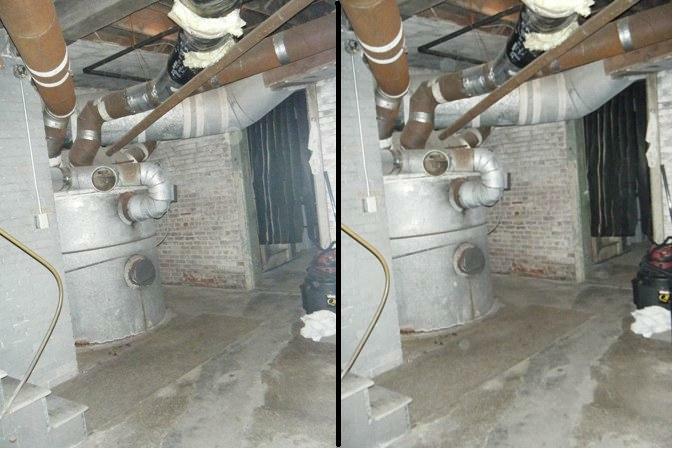 less than 5 seconds later, in the second photo, there is nothing but a white anomaly on the left side of the door frame that looks like an orb in motion heading back into the the room. (You may click on the picture to enlarge it.) Is this proof? No. Is it interesting? You bet! It certainly was a night filled with some thought provoking, some funny and some downright scary moments. 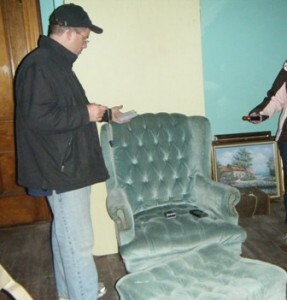 All in a night’s work for a ghost hunter. I would like to extend a great big “Thank You!” to owners Edwin Gonzalez and Lillian Otero, also to Ron Kolek and all of my fellow NEGP crew members for a great night ! Every once in a while, we take pictures at family gatherings or at random places and sometimes those pictures contain orbs. Orbs seem to be more prevalent in pictures now than ever before. I believe this is due to a couple of reasons. With the ease of digital photography it doesn’t matter how many pictures you take, as compared to the old film cameras where you would save your precious frames of film for something important because each frame cost money to develop. More pictures are being taken, so understandibly there are more opportunities to catch orbs and anomalies in your photos. 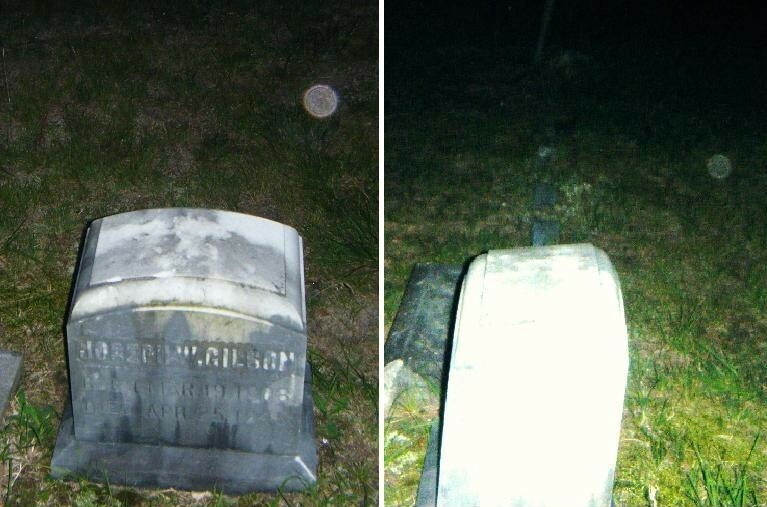 Another reason for more orbs caught in digital photography is the placement of the flash on the camera itself. It is much closer to the lens, therefore if there is dust, moisture or pollen in the air that is close to the lens it is much easier for that particle to be illuminated. But is every orb dust, moisture or pollen? I have some examples to compare. This photo is an example of dust. 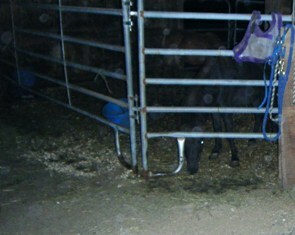 This photo was taken on a private investigation at a residence with horse stables. You can see the small particles of dust that were being kicked up as we were walking through the stable. The closer the dust particles get to the lens, the larger they appear. 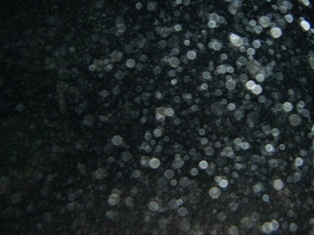 In this photo the particles are not too close to the lens and are easily identifiable. They are dull and grey brown in color. There wasn’t much of any spiritual activity reported by the owner at this end of the barn. This next photo is an example of moisture. There is almost always moisture in the air, but on this evening it was misting. The water droplets are clearly seen and are very bright and white. I have also taken pictures in cemeteries at night and seen random water droplets appear in my pictures. Do not always jump to the conclusion that what you see within your photos is spirit activity. Look at your photos with an unprejudiced eye. It is so easy to get caught up in the excitement of catching something that you forget to think logically. Next is an example where dust or pollen could possibly be ruled out. In these pictures we have the same gravestone at Gilson Road Cemetery in Nashua, NH. I usually take pictures when I am feeling the presence of energy. The first picture was taken at 7:35 pm. I continued to walk around the cemetery and took more pictures. Feeling energy, I snapped the next picture, unaware that it was the same stone at 8:04 pm.  It appears the orb of energy has not moved much from the original picture taken at 7:35 pm. Note there are not other anomalies around. Coincidence? What are the chances of dust, pollen or moisture staying within the same vicinity for 30 minutes? If you have an orb in your picture that you believe is your Great Aunt Wilma and she is sitting on your shoulder, there must be a reason for you to think so. 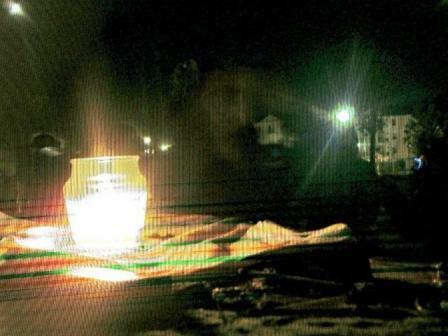 I believe that spirit energy does show up in photographs and we should take note that spirits of family members and others are around us. There will always be naysayers that will tell you that all orbs are dust, moisture, pollen or even bugs. I would never tell you that Aunt Wilma is just dust. All orbs are not dust, just as all orbs are not spirit energy. Everyone loves an interesting photo, and here is another from my collection. This photo was taken at my wedding in 1988. The man shown is my husband’s father. He is standing inside my friend’s kitchen. Through the curtained window, you can see across the empty garage to the outside window on the far wall. It was grey and overcast outside, and there was no one smoking. There is a strange streak of light that suggests movement and seems to be surrounded by a mist of some sort. The shape of the anomaly almost resembles that of a rib cage and spine. My husband’s mother died just months before this picture was taken. Might she have accompanied her husband to be at the wedding? It was brought to my attention that the picture on page 95 in my book is too small to view what looks to be a ghost dog in the lower right hand corner of the double doors. Can you see him? 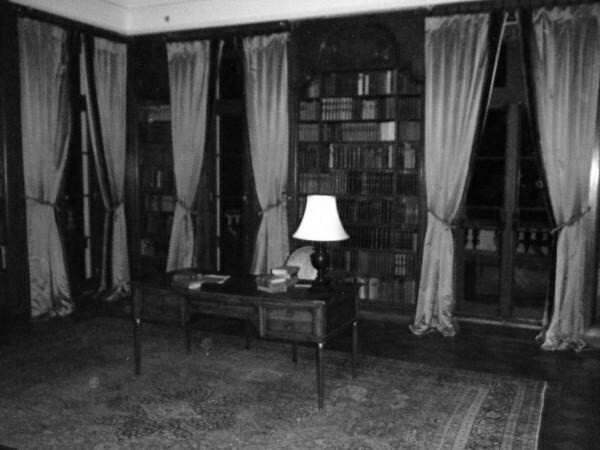 Taken at the Edith Wharton Mansion in Lenox MA. I am a firm believer that there are Angels as well as Spirits around us everyday. I also believe that my life is being Divinely guided. On June 5, 2010 I had what I believe was an encounter with the Divine. I was driving south with my daughter down Union Ave in Laconia, NH, when I noticed a very bright silvery pink glow from across Paugus Bay. To my astonishment I saw the figure of a woman standing in the clouds over Lakeport. I asked my daughter “Oh, my God, Can you see that?” She pointed to the silver pink glow and said “That?” I excitedly told her to grab her cell phone and take a picture of it. She complained that she didn’t want to take a picture of a cloud, but I insisted. I told her to take the picture on the count of three and she did. I then instructed her to send it immediately to my email. 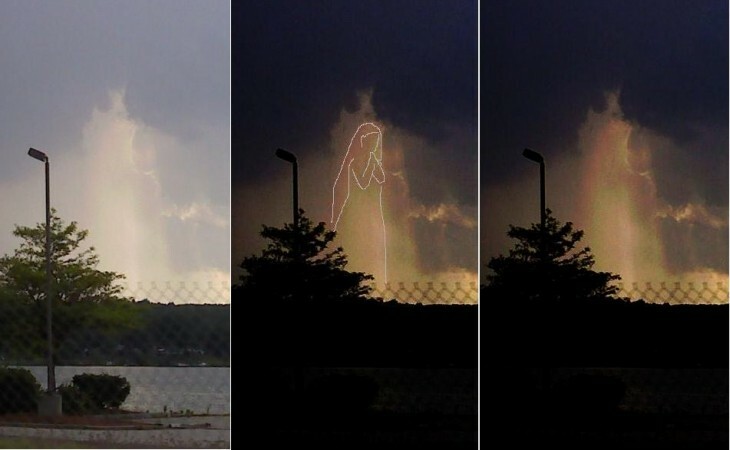 When I got home and opened up the image at my computer, I was astonished that my eyes did in fact see what I thought they had seen, a woman in the clouds. I posted it immediately to my facebook account, but people couldn’t see her. I reposted the picture, this time darkened for contrast, to make the woman more visible. Still, people were not seeing her and were looking elsewhere in the clouds. I then traced her outline. Could this be the Blessed Virgin? Was she there for me to notice? Was she sending me a confirmation that my life is being guided by the Divine? I know in my heart the answer to these questions. What do you believe? The Face of a Spirit? Recently, I was working as a medium at an event in Salem, MA. I was taking some pictures to document what was going on while Ron Kolek of the New England Ghost Project read a spell crafted by Christian Day to invoke the spirits to show themselves so we could photograph them. In the Commonwealth of Massachusetts it to illegal to enter a graveyard after dark, so we stood outside of the Howard Street Cemetery at the stone wall. I placed my camera on the wall, pointed it toward the candle and pressed the button. 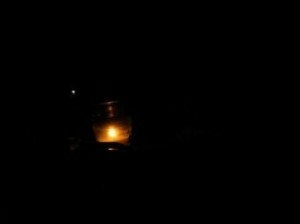 As you can see, it is a normal picture of a lit candle. Then I pressed the button again. I noticed in ths picture that there were green and red lines running horizontally, and other vertical lines as well. I couldn’t imagine why that would be so I decided to raise the brightness in the picture to see if I could see what was going on, and this is what appeared. I can understand how this picture could be easily and hastily dismissed because the face is so perfectly centered. I can guarantee that it has not been tampered with. I have sent the original file to a Professor of Photography at Dartmouth College to study the image and verify that is has not been altered. 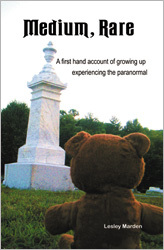 Author Lesley MardenPosted on November 8, 2010 April 20, 2011 Categories Photos7 Comments on The Face of a Spirit?